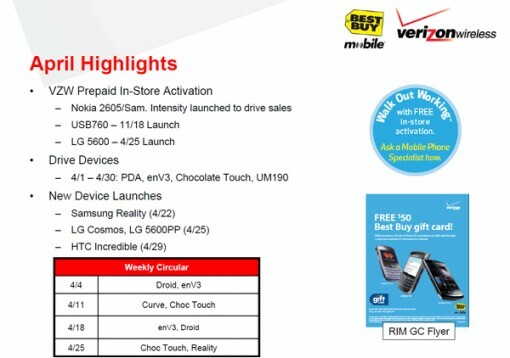 Verizon to Launch HTC Incredible 4/29: Is This Legit? I wrote an article yesterday talking about how the HTC Incredible was coming to Verizon on 4/29/2010. My mistake was that I didn’t provide a link to verify that date and a lot of comments came in that were asking me to verify my information. The image above is where I’m getting my information about the HTC Incredible coming to Verizon on 4/29. This link was provided by brighthand.com and claimed it as a potentially leaked document from Best Buy. Is this information legit? Honestly, I don’t know…. what do you think? So yes, this could very easily be fabricated information since I don’t have an actual link from Best Buy, nor can I find any other link on the web other than people like me talking about the news. I will keep my ear to the ground to see what may pop up on the web regarding the HTC Incredible launch date.